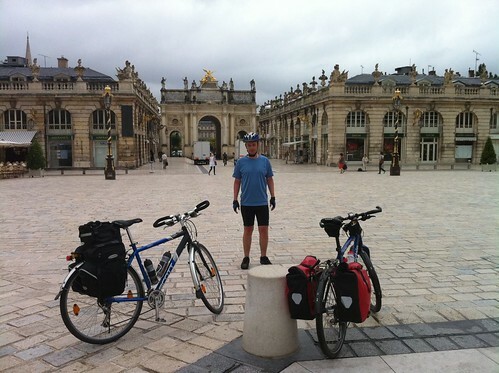 Get up later than recently and cycle into Nancy to take a look at Stanislas Square, which is absolutely delightful. However, leaving the city going south is even worse than entering it last night. The signposting is terrible and we nearly end up on a motorway! But after wasting half an hour we finally find the route to Epinal and cycling is a real pleasure. As we get close to lunch the rain gets worse, until at Epinal, after 45 miles, I feel absolutely sodden. Although it is an improvement on the previous daus' scorching heat (the journey is starting to feel a little like a biblical epic!). And the dreadful weather persists as we continue. Eventually we reach Remirement, only 12 miles from our destination for the day, Le Thillot. Of course bicycles aren't allowed on the main route and the only alternative involves taking a 9-mile diversion. 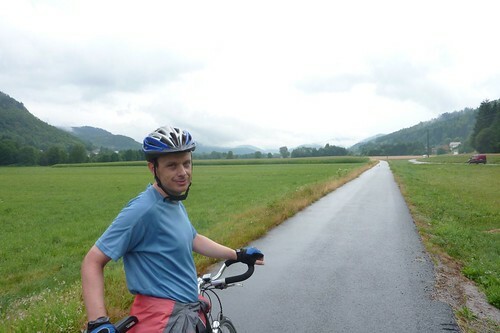 But eventually we find a fantastic cycle route that weaves in between villages and away from the main road, taking us right to our hotel door and we arrive, looking rather disheveled, for a gratefully-received bath and meal. The route has been 88 miles, 11 more than planned.